Yesterday, I lunched at a local restaurant with a congenial group of friends. About midway through the meal, an out-of-town visitor at a table in the front of the restaurant created a ruckus. Obviously, that person was unaccustomed to the relaxed movement of life in Cajun country and voiced uncivil complaints and demands for McDonald type service. We were sorta’ discombobulated about the behavior of this person and began to talk about the times we had been in a group dining out, and a person in the group asked that perfectly good food be taken back to the kitchen because it was cold or because it had too much salt, etc. We agreed that on these occasions, we had felt discomfort and embarrassment for the chef, the server, and the restaurant because of the complainer’s actions. I might add that it’s hard to believe that anyone would complain about the food or service in Acadiana, a place where meals are celebrations. In today’s culture, consideration and courtesy are anomalies. We don’t seem to possess the wish or will to honor one another, and if my words seem preachy, see for yourself – turn on the television set and watch it awhile, thinking about the phrase, “honor one another.” What you’ll see is a lot of bickering, name calling, and cynicism in public discourse and debate, in news reportage. As Mark DeMoss has said, “It’s virtually impossible to have constructive dialogue or to inform and educate people in an uncivil environment.” He’s talking about the prevailing climate of contempt rather than the art of civility. Christians on the right and left behave so badly that a recent statistic revealed non Christians between the ages of 16-29 think that Christians are insensitive to others (Jonathan Merritt writing in The Huffington Post). For example, again, turn on the television set and watch the diatribes of Christian evangelists. We often ignore daily discourtesies like the woman in the restaurant, tolerating vulgarity and violence as if we were watching actions that occur on another planet. However, at least one table of ten gray- and white-haired women, who care about courtesies and consideration, had a lively discourse about restoring the art of cooperative engagement, otherwise known as the art of civility. This art has as its basis, The Golden Mean, which seems to be a bit tarnished nowadays. On my shelf of books written by Louisiana writers are several books by Don Thornton, a good friend, now deceased, who lived across the road in a neighboring subdivision. 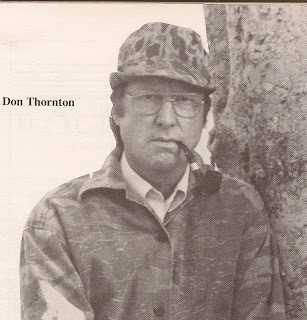 I have written several profiles of Don that appeared in regional magazines, and when I think about the time I was writing the articles, I remember the wonderful interviews I had with him. He died of cancer a few years ago and left a formidable legacy of paintings, sculptures, book illustrations, and poetry. His deepest love, perhaps, was his career in teaching gifted and talented children in St. Martin Parish. He published at least seven books showcasing the children’s talents and told me that kids were his real friends because he was inspired by their innocence and excitement about discoveries. I met Don in the 80’s when he began saying that writing had become first in his career as an artist. He started writing poetry when he was ten years old, and by the time we met, he claimed that poetry had won out over the brush. His work appeared in 26 literary publications and four major anthologies of poetry, and he illustrated poetry for eleven publications. He produced most of his work in a geodesic dome he built himself (he was also a building contractor) in his backyard. “My poetry reflects my engagement with philosophical questions, love of scientific inquiry, and concern with the human condition,” he said. Don called himself a “sharecropper’s son” who overcame many obstacles to become educated, receiving a Master’s degree in Art from LSU. He later exhibited his paintings and sculpture all over the world, including the Houston Contemporary Art Museum. He also designed sets for the Houston ballet. Don loved the outdoors and co-owned a fishing camp at Dulac, Louisiana, from which he would set out for Last Island to fish for Gulf catches. We always talked about making a trip to Last Island with him and his wife Suzy as I was fascinated by the devastating hurricane that leveled everything on the Island during the 1800’s. However, we couldn’t coordinate work schedules to avoid the mosquito season (which is always in Louisiana), and I still hope to make that trip. I have one of Don’s paintings of the chenier country that I love, but I also treasure his books of poetry. In 1986, when he was working on A WALK ON WATER, Don called me to come over to share a catfish meal with him and Suzy so we could preview the book. I took along my grandson Martin who was seven at the time. While Don fried the fish, he noticed Martin getting restless and stopped mid-fry to unearth a large sheet of white newsprint, a set of poster paints, and a brush for Martin to entertain himself, then returned to his cooking. He was like that – very caring about children and fierce about them living up to their potential. That fierceness and passion for children’s education inspired respect for him in the teaching world. He was beloved by children and teen-agers who attended public schools in several Louisiana parishes. Don once touted New Iberia as a place steamy with ideas. He appreciated the richness of coastal history and the Cajun character. I’m including a few of his wry, short poems from A WALK ON WATER, his poetry book in which he wrote about “the little things made precious.” Of them, he wrote “the poems articulate a willingness to share this planet with all other life forms….observations of a tree frog or a roach are given due respect in a non-hierarchical account.” A visit with Don always inspired me to keep writing, and I miss him. in your leap for joy. I must have called up some critters yesterday. I was reminiscing about the abundant wildlife in the yard of House #2 at Sewanee, Tennessee and lamenting the absence of animal life and my favorite bird, the loud-mouthed crow. I began sweeping the patio and pushing back the ubiquitous oak leaves that fall in the backyard year-round, feeling as though I should clean up the place so that the yard would be inviting for critters, preferably the crows. Well, the preparation worked. 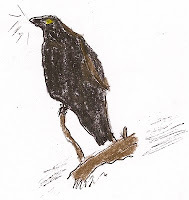 When I went outdoors to check the temperature and the direction of the wind this morning, I heard crows squawking as they flew above the coulee bordering the backyard. About midmorning, a fat armadillo appeared, foraging near the patio, blindly swaying back and forth across the yard within a few feet of the house. Big rats they are, and fascinating to observe after they’ve been foraging all night, reeling across the yard as if they’ve been in the bars dancing to chanky-chank music and drinking beer until daylight. As for this big rat, I admit that there are very few of them at Sewanee, and I’ll endure a few armadillos in lieu of Suzy Skunk who visited our garage on The Mountain this past Fall, leaving her aroma behind. We drove around in a pungently-scented car for a week or so. finding their lovers in new nests. take your pick: they’re only messengers. to its prey, an owl lost in daylight. speaking loudly of filial piety. 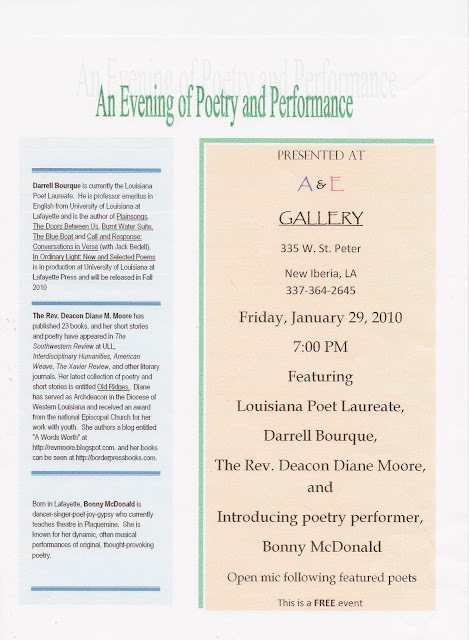 When I returned to New Iberia, Louisiana this Fall, I had no notion that I’d become part of a poetry reading with our gifted Poet Laureate of Louisiana, Darrell Bourque, or that I’d be introducing him at this reading. Paul Schexnayder, Louisiana’s outstanding folk artist, whose whimsical paintings have gained attention far and wide, has established a new gallery that he uses to showcase artists and photographers and to provide space for artists who express themselves through the written word – namely, poetry. He and Margaret Simon, a Creative Writing teacher in Iberia Parish schools,who paints portraits of our canine friends, sings with the Heavenly Choir at the Episcopal Church of Epiphany, and also writes poetry, organized the upcoming reading at Paul’s gallery, the A&E Gallery on St. Peter Street. UPDATE ON “THE LITTLE ONES OF HAITI"
Readers will remember that I published a blog about an art exhibit showing pictures of Haitian children painted by Barbara Hughes who teaches art and spirituality at the Sewanee Theological Seminary. Barbara had accompanied the Sisters of St. Mary on a mission trip to deliver a water purification system and to work in the Faith-Hope-Love Infant Rescue orphanage in Port au-Prince. Vickie and I had helped raise money for this mission and received funds from many Louisiana friends, as well as from the Rt. Rev. Bruce MacPherson, bishop of the Episcopal Diocese of Western Louisiana. A few days ago, when the earthquake struck, we talked with the Sisters about sending the money dedicated to a scheduled mission trip to Haiti to the Episcopal Relief and Development organization who can send immediate assistance to Haiti. The Sisters were happy to send the donations on to help provide food, water, and medical care for the earthquake victims. Dorothy listed an address for donations to Christian Light Foundation, Inc., P. O. Box 23881, Jacksonville FL 32241-3881 with memo: For D. Pearce, Haiti. During Christmas holidays when my granddaughter Kimberly visited, we talked about some of the many trips we made traveling from the high desert of Antelope Valley, where she lives, up the California coast to Carmel. 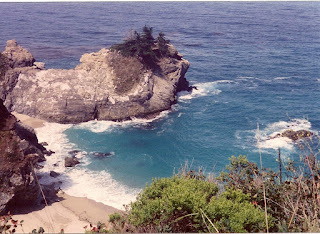 We recalled the wonderful times we had climbing rocks near Point Lobos and watching the seals sun on the stony promontories in the Pacific Ocean. Kimberly was the only family member who accompanied me and my friend Vickie to tour Tor House, the home of the poet Robinson Jeffers, located just south of Carmel. Jeffers, a profound poet who often wrote strident critiques of humankind’s ballooning egotism, built Tor House when Carmel was still wild and stormy, and much of his poetry centers on the sites of Point Sur, Point Lobos, and Pica Blanco. Jeffers’ home was built on ground that was once the site of Carmel Mission, and when he constructed the foundation for a chimney, he found remains of fire pits used by ancient aborigines. Hawk Tower, a 40-ft. tower Jeffers built alongside Tor House, was made of granite lifted from the stones of the Pacific. The tower took Jeffers four years to complete by hand and eventually became the retreat of Una, Jeffers’ wife. Kimberly was fascinated with this dark house on the rocky coast, particularly the fact that the home was lit by candles for many years. She seemed impressed by the story of Jeffers’ life and the account of his construction of Hawk Tower. When the guide ended our tour in the library, he asked if one of our touring party would read the poem “Tor House,” and Kimberly and Vickie gave me a nudge. I stepped forward and read this poem about the ocean and the “wild sea fragrance of the wind” …and a ghost, “a dark one, deep as the granite.” “You should become a professional reader,” the guide said, and I stepped back. “I write poetry,” I told him, hastily passing on into the lovely garden filled with flowers, including alyssum planted by Una. 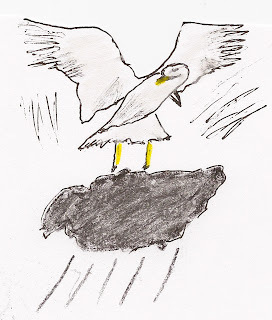 This is only a quick sketch about this uncompromised poet who loved the rocky Pacific coast. His poetry resonates with me and inspired me to write a minimalist poem when we visited Point Lobos on that wonderful trip about which Kimberly and I reminisced at Christmas. The poem is taken from my chapbook, SOARING. majesty disappearing into the fog. surrender to ocean’s eternal season. 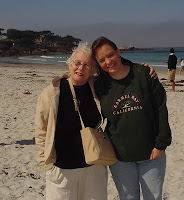 Photo of me and my daughter Elizabeth, mother of Kimberly,at Carmel Bay, and of Point Lobos, by Vickie Sullivan. Some mothers can say that they have a son-in-law they would have liked to have married, but most of the time when females get together to talk about family, I hear a story that includes a lot of sour notes about their daughters’ lifemates. With regard to my eldest daughter’s choice of a spouse, not so! This tall, handsome man of Spanish-Italian lineage happens to be one of those accommodating guys who not only responds to but initiates “honey-do” projects around his home and yard… and mine as well. Before the recent big freeze, my daughter called and said “Brad is coming over to put shields on all of your faucets,” and hung up. I was still in my pajamas when he showed up, sock cap on his head and several Styrofoam sheaths in hand, looking as pleased as if he had just received $2500 for the latest miniature armoire he recently built. For the one faucet he couldn’t sheath, he went home and returned with a towel to wrap and tape the pipe. Yesterday evening, my daughter called and said, “it rained today, mama, and I know you didn’t realize that the wrapping is wet on that pipe, so Brad is coming to rewrap your faucet.” All this occurred without any beckoning on my part. “What would we do without Brad?” my daughter often says ruefully. Indeed, what would I do? Two years ago, a few nights before a wedding in which I had to serve as deacon, one of the arms to my only pair of eyeglasses suddenly detached from the frame. In panic, I dialed my daughter’s house. “I won’t have time to get the glasses fixed before the wedding,” I wailed. “Not to worry, Brad is coming over,” she said and hung up. Five minutes later, Brad appeared with at least three kinds of tape and began to experiment with one that would disguise the broken limb and wouldn’t advertise me as an aging street woman wearing one-armed eyeglasses who happened in on the wedding. No one at the wedding noticed the patched arm. Another time, after a plumber came and cracked the tile behind my shower so that half the wall came down, I again sent out an SOS to Brad who said, “You can either put in a new wall or rig it. For economy’s sake, I think you should rig it.” The broken half of the wall went home with Brad to file down the jagged edges, and a few days later, he appeared with it and a tube of some kind of glue. The crack is almost invisible, and after seven years it’s still intact. Brad owns “Restorit,” a furniture restoration business of which he is the sole manager and craftsman, and he turns out exquisitely, meticulously-restored antique furniture. He often rebuilds not-so-valuable pieces of furniture in a large shop where broken chairs hang from the ceiling, and long boards of cypress, pine, oak, walnut, and Philippine mahogany are stacked on the floors. It’s a huge metal building filled with vats, a full complement of carpenter tools, and pieces of furniture that look like they’re remnants of a garage sale – until he begins to work them over. One antique desk that belonged to my great-grandmother Dora Greenlaw came to me in pieces, and I felt that it would never resemble a refined piece of furniture again. I gave it to Brad to resurrect, and the photo below speaks louder than any of my brags about Brad’s restoration of this valued piece. If you show Brad a picture of a piece of furniture you covet and ask him to build it, he takes the picture to his shop and a few months later, he appears with a beautiful facsimile under a tarp in the back of his truck. For Christmas, I gave him a coffee table book about old homes along the River Road near Baton Rouge, Louisiana, mostly because it showcased antique furniture. He sat entranced with it after Christmas brunch. To date, Brad has built for me an antique television cabinet, a coffee table, a facsimile of a Creole side table, an Empire side table, and a jewelry box. He has refinished the seats of century-old dining chairs, painted the yellow table I described in a previous blog, repaired dragging doors, put in towel racks, and revived my car many times when the battery died. When we moved to Sewanee, he gave me an oak bureau and an oak bedroom end table he had restored, and accompanied me to a second-hand furniture store to find a dining room table and chairs. He followed behind me as we searched for antique pieces, and his way of vetoing the wrong choices was to lower his voice, saying, “Just leave that piece right where it is.” We went through a lot of “left behinds” before we found the appropriate furniture. While we were in one store, and I was wandering around on my own, he suddenly appeared behind me and said, “Let me show you something.” He led me to a corner where a forlorn-looking, faded red velvet chair stood and bent down to show me the intricate design on the rosewood bordering the seat of the chair. “If I had a way to take this back to Louisiana, I would,” he said. I bought the chair. Brad is self-taught and in addition to his ability to build and restore furniture, he plays a guitar for his own amusement. He has also restored the cases of several violins that hang on a wall of his den. At one time, Brad played with a rock group for almost a year in Tampa, Florida, working during the day and playing at night, before he decided that he would return to Cajun Country “to Stephanie and to get a life.” Guitars, however, are still in his blood. Last summer when Brad and Stephanie came up to visit, we spent some time in Nashville, taking in the Grand Ole Opry and visiting guitar outlets. We went in the Gibson guitar outlet, and Brad came out with a guitar. We also visited the famous Gruhn shop in downtown Nashville, but we came out sans guitar because the prices resonated with sour notes for the pocketbook of a restoration artist. Most of the time you see Brad, he’s wearing a baseball cap and blue jeans that have seen much wear from the work he does at Restorit, so he felt some trepidation when he had to dress up for the wedding of my grandson Martin about this time last year. He confessed he was nervous until he put on the handsome new suit my daughter had selected for him to wear. “That was a magic suit,” he says. “The minute I put on the coat to it, my tension just melted away. I was a new man.” He’s a modest man, so he’d never believe that he’s handsome even in his faded blue jeans. Ask all the elderly women in New Iberia who appreciate his talents, as well as his good looks and charm! On wintry days when the tin-colored sky could be depressing, I look for places of light, and the room in which I begin my days is the dining room where I sit at the mahogany dining room table and look through undraped windows at a small sunroom, the room with the most light in the house. The sunroom “came with the house” and is only large enough to hold a glass-topped wrought-iron table painted a bright yellow by my much-appreciated son-in-law who also likes brightness. It’s flanked by four yellow wrought-iron chairs holding soft blue cushions. The sunroom heats up mightily during summer, but in the early Spring, it’s a pleasant place to lunch while looking at another view–a Louisiana coulee bordered by abundant fern, ginger, elderberry trees, vines, and giant elephant ears. I once used the glass porch as my writing room and moved two shelves of poetry books into it, then moved out because the dining room table provided more writing space. A futon was housed on the glass porch until we moved to Sewanee, and several friends have used the room during times of emotional crises in their lives. These women have told me that it’s a magical room with an aura of sooth and peace. One friend sat on the floor of the porch (before the futon arrived) an entire afternoon, recovering from the schism of a broken marriage, and in recent years, she sometimes shares lunch with us on the yellow, glass-topped table, talking about the powerful atmosphere in the room, about writing, religion, and relationships in a “let your hair down” chat that stretches into three-hour conversations. It’s important for women to have a “room of one’s own,” a meditative space of “incandescence (as Virginia Woolf once wrote) in which creative activity is unfettered and free.” Woolf advocated that female Shakespeares should have two avenues to freedom: fixed incomes and rooms of their own. I remember Virginia’s remark every time I go onto the porch, thinking about her big question: Why is it that men have always had power, influence, wealth and fame, while women have had nothing but children? This is a wry question that doesn’t quite describe the condition of post modern American females, but there are many women in the world who still lack freedom, fixed incomes, and rooms of their very own. mountains gathering the only light. becomes words in the morning. Isabel Anders, my writer friend at Sewanee, Tennessee who collaborated with me on a mystery entitled CHANT OF DEATH (still being reviewed by a publisher), has a new book In Press. BECOMING FLAME: UNCOMMON MOTHER-DAUGHTER WISDOM will be released by Wipf and Stock Publishers in March. Isabel has written classics in religion and spirituality, including AWAITING THE CHILD, which features a special introduction by Madeleine L’Engle, Isabel’s teacher and mentor. I had the privilege of seeing the original manuscript of BECOMING FLAME in 2008 when I read it aloud to my friend Vickie while we traveled from Sewanee, Tennessee to Louisiana. I knew then that the manuscript was a gem which belonged on the bookshelves of all women who try to impart wisdom to their daughters. The style of the book, which resembles Socratic dialogues – question and response -- is highly effective and emphasizes the distinct character of woman-to-woman discourse. 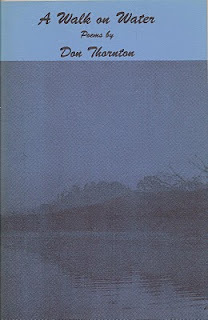 Dialogues remind me of Louisiana Poet Laureate Darrell Bourque’s latest volume of counterpoint poetry, CALL AND RESPONSE, a book that Bourque wrote with fellow poet Jack Bedell, featuring poems patterned after responsorial type songs in the work fields and in Catholic and Anglican churches. 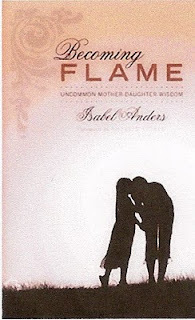 Isabel’s scenarios in BECOMING FLAME emphasize the value of exchange and connection in the most personal of spaces – the home -- and in the most personal relationship of mother and daughter. Readers will recognize Isabel’s strong theological grounding in the inspirational exchanges between mother and daughter. Isabel is a graduate of Wheaton College and has an M.A. in Religion from Mundelein College, Chicago. She received an Ohio Arts Council fellowship in Creative Writing in 1989. She’s also managing editor of “Synthesis,” an international magazine of commentary on Biblical readings for the Anglican Church calendar each year. Among Isabel’s other books are FACES OF FRIENDSHIP and SOUL MOMENTS, two rich texts that illuminate her spiritual journey. I love one of the quotes about feminine theological inquiry written by L. Maloney that Isabel included in her latest blog: “…God has her skirts tucked up and is busy sweeping and searching too…” I miss the “writerly” conversations Isabel and I shared during coffee breaks and lunches and while breakfasting after services at St. Mary’s Convent, Sewanee, where I first met her. You can see her blog at www.IsabelAnders.com. Last week on a typical monsoon day in Louisiana, I sat in the Winn Dixie parking lot, waiting for a shopper to pick up a few items from the store and watching passersby slosh through ever-widening pools of water. Seagulls soared through the lot, now dark silver in color, now white, their colors conforming to the color of cloud patches overhead. I wondered if the gulls thought a beach lay nearby and if they were puzzled about the lack of sand. I know that they’re ground nesting carnivores, but their hunting ground is usually near the ocean where they search for crabs and small fish. They also nest in dense colonies, but only a few gulls dipped over the lot. Did they think that the umbrellas moving in and out were beach umbrellas? Did they think the smells coming from the deli signaled a picnic? By the time the shopper returned to the car, most of the gulls had dispersed, except for a lone scavenger that landed on a “$4/12 Pepsi” sign and finding no food, sailed off, squawking loudly, into black rain clouds.